Exercising isn’t just about toning muscles and losing fat. It’s also about improving the functional elements that we use every day like balance, strength, endurance, stability, and flexibility. Use this active aging routine to enhance your ADL’s (activities of daily living) and watch how little things you do every day become easier. 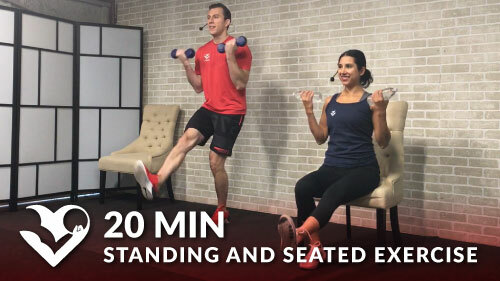 This 30 minute exercise for seniors, elderly, older people, or anyone with limited mobility includes both seated and standing variations. You may use a pair of light dumbbells of water bottles for extra resistance, but it isn’t required.